I hope you had de"light"ful week. It was the summer solstice and for me that means ceremony. Yes I got my drumming on. I also got my despacho kit out, and the lovely bundle you see above is the result. I love ceremony, and it forms a nice cornerstone in my practice. Despacho for me is about gratitude for what I've been blessed with and asking for what I need in the moment. Asking for blessings and receiving them are two different skills. My life is filled with mostly unbelievable chains of events. I still have a hard time believing half the things that occur, and I was there for them. You'd think that doing the work that I do I would be totally chill with things showing up just when I need them. I apparently have a high subconscious threshold of incredulity. Some of it stems from control issues and the fantasy version of reality we are sold by culture and media. It colors so much of how we perceive our lives and the "natural" paths that we think lives are supposed to take. I spent many years metaphorically banging my head against the wall trying to get things to happen. Only thing was, I was following the logical script of how things happen. We have a false perception of how the defining factors of our lives come together. This is all enforced by countless movies (I'm looking at you romantic comedies...liars) and television shows. We on the surface know that it is all fake, but when it is all we are feeding our subconscious mind, well that is what it builds the lens of our perceptions with. This is why talking to real people who have found a path to the life they dreamed of is so important. You get to see how much luck and chance had a hand in the recipe of their story. That chaos that is life seems to weave in and out of all of our experiences like the currents of the ocean. Each tendril carrying us across the sea of time in a pattern too complex for most of us to comprehend. This energy that some call fate, luck, or providence doesn't exist in a vacuum. Our actions, reactions, and basic nature steer us in that current. Some days we are barely treading water and other days we are cruising along at top speed towards the summer isles. I've had some really good turns from the luck wheel lately. I'm super grateful for it. Oddly enough though it has made me nervous. I've had a hard time accepting this good fortune. Yes I know it is a good problem to have if you have to have a problem at all. Again let me repeat I am grateful, and I am not complaining. I am becoming aware of my own inner resistances to receiving the good that I've been requesting in my ceremonies. The manner in which some of the blessings have shown up have me asking the question, "Do I really deserve this?" Why am I telling you all this? Well sometimes blessings come to us in ways that we don't expect. When they don't follow the societal script of how things should arrive we can somehow doubt our worthiness to receive them. I will point out that if you are judging yourself in this manner, you are likely judging others as well. So stop it already. Learn to take the compliment, and receive the gifts that you are given. When you have a run of good luck, make use of it and be sure to spread it around. There is no one "right" way as to how things should happen for us or anyone else. When we get caught up in the cultural fantasy land of the way things should be we miss out on the miracle of the way things are. So loosen up, relax, and count your blessings without worrying over whether or not you deserve them. I assure you that you do, and by extension so does everyone else. What a week! I found myself back in the studio revisiting some old ways of working, and my oh my did the gifts flow from that. Here is to hoping this week has gifted you with something of value whether it be tangible or not. 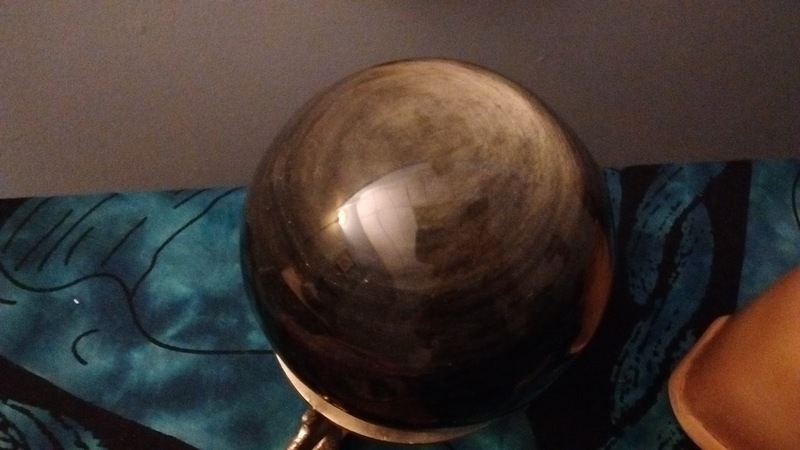 One of the tangible gifts I received this week was the orb you see above. I had to consult with some people to find out the identity of the stone, but our best guess is gold sheen obsidian. The spiritual properties of the stone are quite revealing as to the focus of my journey at this time. Some of those include: healing from the abuse of power, learning to use your own power to manifest more effectively, and scrying that reveals the core of a problem or pattern. Receiving this as I move back into clay work is quite apropos. I have had problems with authority. Yes I know, shocking. Without going too far into the backstory I had an extensive feud with an authority figure when I was in the process of getting my art degree. I had four years of public humiliation and backstabbing by authority. 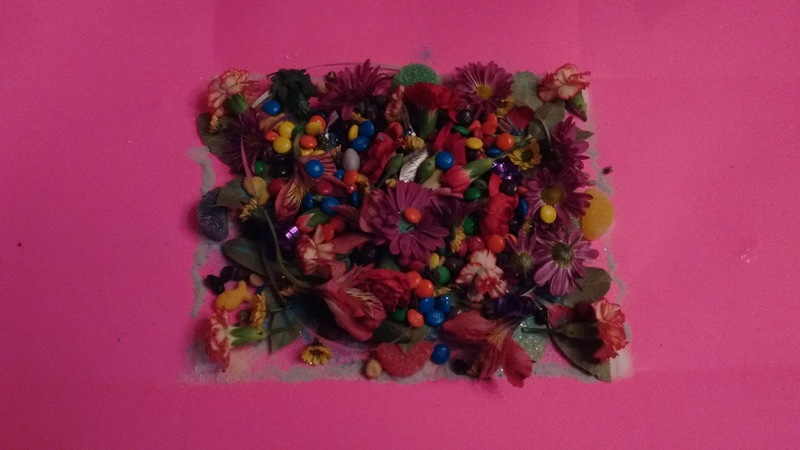 It really put a crimp on my creative output and belief in myself. Subsequently I have had just about every obstacle you could think of come into my path as I have tried to make and sell my artwork. It has been exhausting. Dreams, I have often remarked, show us what is going on behind the scenes. Sometimes they also hint at the future, but peering behind the scenes I find to be more valuable. That was the intangible gift of this week, one I believe this dark orb helped to unlock. I have been out of academia for more than a decade, but I have hundreds of school dreams each year. I'm back there again and again without a purpose, feeling out of place, and always missing either a physical item or vital piece of information. For you readers of omens out there, you may be starting to see where this is going. Well pardon me if I am sometimes just a wee bit dense. The latest back to school dream finally crystalized it for me. So I'm back at the university post graduation, but I still have some work to collect that was fired in the kiln. I try to sneak in the studio and the authoritarian adversary is there. As I am trying to carefully extricate pieces off the shelf I accidentally knock one off and it shatters. I am sad because it was one of mine that I thought might be good, but also relieved that I didn't ruin anybody else's work. Upon making the noise Mr. Authority figure looks at me, and says, "You aren't being very amiable to me. You know I am taking on a bigger role in the art community and if you're not nice to me your work won't go anywhere." I look down at my work and I don't like it, I feel it is amateur and not good enough. As soon as I recalled the dream in the morning I had a lightbulb go off over my head. The reason I keep dreaming myself back at school is because I left a big part of my creative power and personal authority there. My consistent doubting of my talents, skill, and worth began in that place. I now know that somewhere in that place a piece of my soul essence and true power was lost. Why am I telling you this? We tend to circle around issues until they are resolved. The mind will send us coded messages in our dreams. Many of us don't pay heed to our dreams or even remember them. This was not a comfortable dream. None of my school dreams feel good, they've always felt off. I just assumed it was a general anxiety that most of us carry over from our days as students. What if it isn't that for anyone? What if we all left vital pieces of ourselves in the educational institutions. What if the more we dream of school (assuming we aren't currently students) the more of ourselves we have left behind. These dreams could be dark gifts from our lost ones. I know what I intend. I shall ride the wind into the dream world and mount a daring rescue. I shall return with the prize of the light of my spirit. What will you do? Will you seek to remember what you have lost and sing it back to you? Will you chose to forget and resign it to the dark space between dreams? The darkness waits for us all, but perhaps it is waiting patiently as it lovingly holds what we treasure. I hope your first full week of June was fruitful. Mine has been full of change. Right now I'm still catching up to it. If you're wondering about the odd little character in the pictures above I was only responsible for his lower half. That glorious head was the contribution of another artist. I took part in a surrealistic game this weekend called the exquisite corpse. Basically people were divided up into two groups, one group made bodies and the other made heads. Each of us had numbers that we were to keep secret while we worked. I was hoping for a head. 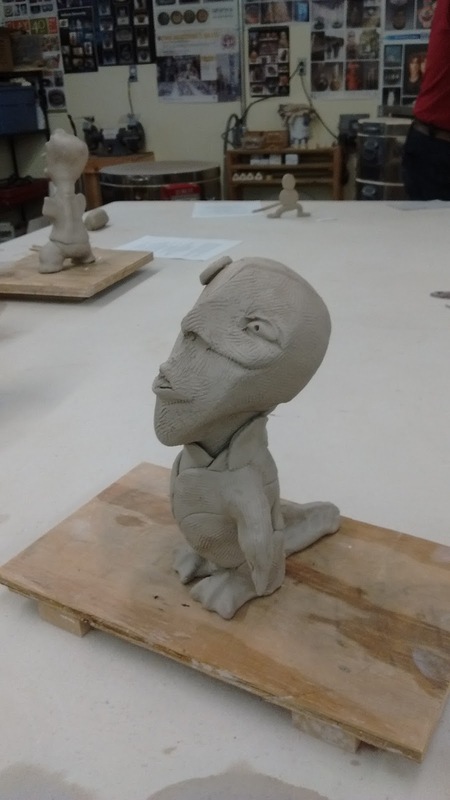 I've sculpted heads before, I was fairly sure I could make one. I drew a body. I had no idea what to do. Well there just so happened to be a circle cutter in front of me in one of the tool baskets. So I rolled out a slab of clay and started cutting out circles. I thought maybe I could do a turtle shell or something. As I worked and made the piece to stand up, I realized it was no turtle. It was a bit wobbly so I added a tail to stabilize it. As I looked around the room I noticed that everyone was making quite large heads so I added the weird webbed feet for a little balance. So now I had a godzilla tail and platypus feet. I could tell it needed something for arms and I went with flipper-like appendages similar to a penguin. 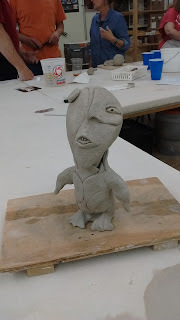 Now all through this exercise I was certain that my creation sucked, I was beginning to doubt the wisdom of joining this clay community. The growing surety that I would be exposed as a fraud with no talent was slowly rising. Time was called, and us bodybuilders got to meet the headshrinkers. When I saw the head I was amazed by it. I was sure the other artist was feeling gipped that his head got such a rotten body. I was wrong. He loved the body's quirkiness, and to top it off it fit perfectly in the opening I had left. When we put them together they just worked. Could my body have been a tad bit more streamlined, of course, but it did create quite a character. I share this story because it is good to note that comparing our efforts to others' is a losing game. My persistent self doubt in my abilities could have completely tanked the evening. Instead I had a wonderful time. The critic in me didn't silence, but I put him in the corner while I worked, laughed, and visited with the other artists. My experience wasn't unique, there were other people who were doubting their efforts as well. Yet we kept working and when we came together we all created something that brought us great joy and surprise. Life is the exquisite corpse game. We never have all the pieces we need ourselves to make the whole picture of life. We often don't even know what those pieces are until we meet the others who bring them. Just as they don't know about the piece of their lives that we've been building. We can worry about our little bit and cry and say it isn't worthy, but if we decide to just smile and nod to that inner critic while we carry on, miraculous things may happen. I've been away from clay for a while, and though it now shares the stage with my healing work it is just as necessary. So what does this mean to you? Well I am sure you have disparate parts of your life that seem to be out of place, but somehow they fit together in just the right way to make you who you are. You may be working away on one half of a life thinking it is meant for one thing, meanwhile a wildcard creation will come along and fuse with that life in chimera-like fashion. So when that happens don't go looking for why it shouldn't work. If it works together just let it be, appreciate it's oddity and uniqueness, and stop doubting the value of your own contribution. I hope this week was enlivening for you. I can hardly believe it is June already. This week was strange with the holiday. Plus this coming week my teaching schedule changes up again, so I am all turned around. I also finally am transitioning back into some of my art projects that have been on the back burner. The picture up above is a polymer cast out of a silicone mold I made from a real cicada. It isn't exactly perfect, but I was happy with the level of detail that I was able to achieve. 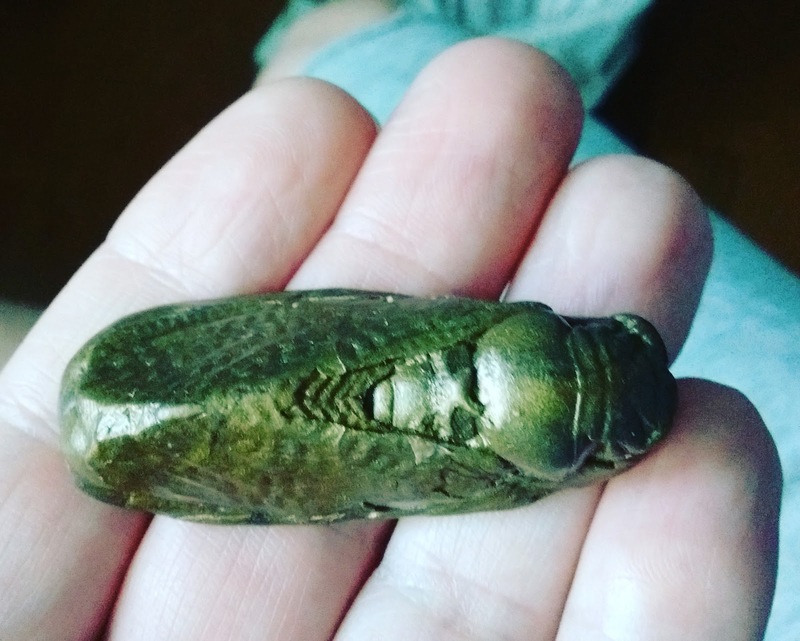 Believe it or not there was no tutorial online about how to mold an insect body. I looked, if I had a proper camera I would have filmed my process. For some reason I keep coming up with questions that google has yet to have the answers for. As happy as I am with the results, I think I can do better next time. The curse of perfectionism is a difficult one to overcome. It is probably responsible for more than half of my procrastination tendencies. I keep wanting everything to run smoothy and get it right the first time. It took me several years to finally produce this cicada positive. Now true, some of that time was pondering the problem of how to mold something so delicate and learning about the process and materials of mold making, but I have had the materials I ended up using for over a year now. The only thing that has kept me from doing it is the worry over screwing it up. I even planned to meet with a friend who had worked in molds. but I finally just bit the bullet one day and decided now is the time. When we sit and wait for the stars to line up we can end up missing out. I am all for people picking their moment, but at some point you just have to go for it or give up. This simple (or actually not so simple) mold was symbolic of finally emerging. Just like the cicada emerges from it's old exoskeleton and unfolds it wings to take flight there comes a time where there can be no more holding back. The cicada sleeps within the earth for years before emerging to fly free, which is kind of what many of my goals have been doing. They haven't been sleeping because the time wasn't right, but because while they slept they could remain a dream without the imperfections of life. Why am I telling you this? Well it is easy to stagnate when you get bitten by the perfectionism bug. There is always an excuse why now is not the perfect time. Sometimes we seem to be waiting for someone to come along and help. People can be great assistance, but ultimately it is us who must crawl up from our hibernation into the sunlit world. When a butterfly exits the cocoon it is a messy and time consuming process, but it has to do it on its own. If you touch the wings or try and help it, then it will never fly. We too must muddle through our own mess if we ever want to transform our lives and ourselves. Life is not an orderly process, nor is it something that can be perfectly orchestrated. So this week if there is something you've been putting off starting maybe you should just decide to jump in, even if you don't have all the pieces. You might make a mistake, you might make a mess, but you will have begun.